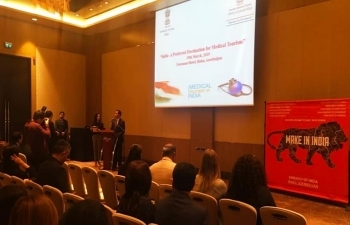 Embassy of India in Baku organized a Medical Tourism Seminar - "India- The Preferred Destination for Medical Tourism", on 29th March 2019 in Baku. The Seminar was attended by health care specialists from India and leading doctors and healthcare specialists in Baku. The panellists shared their views on various aspects healthcare system and how India has emerged as a preferred healthcare destination.